Stand H2, LuxLive, ExCeL London, 14-15th November 2018. At LuxLive this year, LEDVANCE will focus on human centric lighting solutions that create the ideal work-light balance, enabling comfortable and energy efficient atmospheres for employees. Visitors can discover the biological benefits of creating the right light at the right time, engage with LEDVANCE experts, grab a coffee, and see live demonstrations. Join the LEDVANCE team from 5pm on Wednesday 14th November on stand H2 for a stand party to celebrate the first day of the show. Come and see LEDVANCE’s latest Human Centric Lighting (HCL) solutions in the office section of the stand, and experience the benefits of providing controlled and tailored lighting throughout the day, supporting efficient working spaces. By detecting the presence of natural daylight and brightness and regulating the light sources accordingly, not only helps to reduce energy consumption, but also stabilises the natural day and night biorhythms of humans, helping to boost a sense of well-being and improving health. Ideal for office buildings, the LEDVANCE LED Direct/Indirect Panel delivers excellent glare reduction (UGR < 19), and a 70% direct and 30% indirect distribution of light. In addition, the microprism structure of the acrylic glass optimises light diffusion. With a wide range of accessories and add-ons to choose from, the Panel luminaires can be adapted precisely to fit the requirements of each individual office environment. 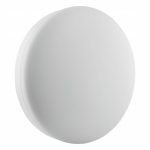 The robust Surface Compact IK10 is ideal for heavily frequented stairwells and public buildings, with a thickness of only 61 mm and a very flat design. At IK10 it offers the highest possible impact resistance, is protected against theft and vandalism, is sealed for life, and can be used in damp locations thanks to its IP65 protection. At 4,000K it delivers up to 1,920 lumens, and up to 1,800 lumens at 3,000 K, and has a rated life of up to 50,000 hours. The high quality of the light produced by the new IndiviLED family of luminaires results from a special optical system consisting of small “light squares”. The fact that each individual LED has its own lens and reflector results in very good anti-glare properties of UGR<19 and an outstanding distribution of light. The large number of optical elements gives the luminaires a special look, and luminous efficacy is also very good at 120 lumen per watt. 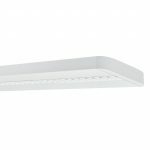 The Linear IndiviLED luminaires are slim 1.2 m and 1.5 m surface-mount or suspended luminaires that can be used almost universally and which can even be combined to form a seamless lighting installation. In line with office lighting requirements, they all provide direct light or a mix of direct and indirect light. 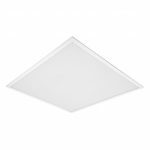 The square Panel IndiviLED for system dimensions of 600×600 mm and 625×625 mm are suitable for ceiling mounting and therefore as replacements for traditional louver luminaires. The IndiviLED luminaires are also available in versions with daylight or presence sensors, with a DALI interface or with emergency lighting functionality. At LuxLive this year, the LEDVANCE stand will feature innovations addressing office, industrial, hospitality and shop sectors. Visitors can explore new lighting solutions addressing all four areas, and discover the biological benefits of creating the right light at the right time with Human Centric Lighting (HCL) solutions. No matter what your lighting requirements, the LEDVANCE team of experts are available on stand H2 throughout the show to contribute fresh ideas and help guide you to the best solution. The lastest office lighting solutions including Linear IndiviLED, Panel LED and SF Compact will be on the LEDVANCE stand at LuxLive, alongside the Human Centric Lighting range.